Yu-Gi-Oh! 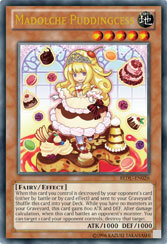 TCG Strategy Articles » Protect the Puddingcess! Home > Special	> Protect the Puddingcess! Return of the Duelist has it all: Spellcasters, Ninjas, and even giant robots! On top of that, there’s a whole group of monsters that are sure to get your tastebuds tingling – the Madolche, an entire Smörgåsbord of sensational sweets! The Madolche (pronounced Ma-DOL-chay) are here to clear the way for their Puddingcess to reign supreme. Are you ready for a taste of the sweetest group of cards ever seen in the Yu-Gi-Oh! TRADING CARD GAME? Every Madolche monster has this effect in common: “When this card you control is destroyed by your opponent’s card (either by battle or by card effect) and sent to your Graveyard: Shuffle this card into your Deck.” So if your opponent destroys one of your Madolches, it goes straight back into your Deck to use again! Thanks to this effect, your Deck will never run out of monsters and Graveyard will never have any monsters. Many Decks rely on having monsters in the Graveyard, but Madolche Decks work off not having any monsters there! There are a couple of key combos you need to know if you want to play a Madolche Deck, and Madolche Magileine helps you put them all together! Madolche Magileine can grab any Madolche monster from your Deck when she’s Normal or Flip Summoned, letting you easily set up your hand for the next turn. A great monster to add is Madolche Butlerusk, who can then search your Deck for any Field Spell, as long as he’s Normal Summoned alongside another Madolche. This is important because the Field Spell, Madolche Chateau cleans up your Graveyard when you play it, then powers up all your Madolche’s by 500 ATK and DEF. It’s like a very yummy Necrovalley! A really easy way to defend your Life Points is Normal Summoning Magileine and searching for another Magileine. If she gets destroyed, she returns to your Deck, so you can Summon your new Magileine and grab her back from the Deck again! You get a constant supply of monsters and take only marginal damage from battle. The Madolche monsters also have some interesting effects that give you an edge in battle. Madolche Baaple is able to switch an opponent’s monster to Defense Position and freeze it there, allowing you to get a quick attack in with another of your monsters, or protect you from a tough attacker next turn. Madolche Chouxvalier can also help powerful attackers at bay, by protecting all of your other Madolches from being attacked, and he has 2200 ATK while Chateau is in play. Madolche Mewfeuille lets you Special Summon a Madolche from your hand when it’s Normal Summoned, allowing you to set up your offense or defense quickly. Speaking of offense, you’re probably wondering why you want keep your Graveyard clear of monsters. The main reason is because Madolche Puddingcess, the tyrant of tastiness, doesn’t like food going to waste! Madolche Puddingcess may be adorable, may be Level 5, and may only have 1000 ATK and DEF, but don’t let her looks deceive you – she will destroy everything your opponent holds dear! As long as you’ve taken care not to let your Madolches hang around in the Graveyard, Puddingcess will boost herself by 800 ATK and DEF points, making her 100 ATK points tougher than Chouxvalier. That’s a total of 2300 ATK with Chateau in play. Puddingcess also has another ability that activates whenever she battles a monster: after the battle, whether Puddingcess wins or loses, her legendary temper tantrums can destroy any card your opponent controls! There are a whole bunch of Madolche Spells and Trap for you to use in Return of the Duelist, too. Madolche Waltz inflicts damage to your opponent each time a Madolche attacks or is attacked, allowing you to make up for their sometimes low ATK scores. Madolche Lesson can clear your Graveyard of monsters that got there by mistake, and give all Madolches you control an extra 800 ATK and DEF. And then there’s Madolche Chateau, the pastry palace that the Madolche call home. Not only does it clean up your Graveyard and give your monsters a boost, it has one extra surprise in store that’s bound to make you want seconds – whenever a monster would be returned to the Deck by a Madolche monster’s effect, you can return it to your hand instead! With Madolche Chateau, you’ll never run out of monsters. In fact, you’ll gain more and more monsters as the Duel goes on and your opponent will have less and less as you destroy them! What the Madolche make up for in lack of power, they more than make up for in keeping you with more cards than your opponent can handle. Between the destructive power of Madolche Puddingcess, the extra cards from Magileine and Butlerusk, and the near-invulnerability of your monsters while Madolche Chateau is active, you’ll have more cards than you know what to do with! If you’re hungry for more Madolches, make sure to head to a Return of the Duelist Sneak Peek to get them for yourself! 3-2-1, Miracle Contact! New EARTH monsters to shake things up!